Alex’s best friend - Marty the zebra - is the eternal optimist. He manages to see the bright side in every situation. However, the situation is rather dull for him here as there is no color. Cheer him up by giving his stripes the color they need. 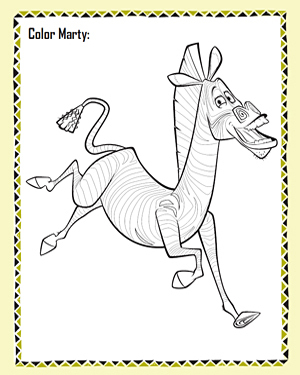 Use crayons or markers to color this fun and cute Madagascar coloring page for kids. Also check out our Color Marty – 2 page.